On 29 April 1999, a young model Jessica Lal who offered to act as a celebrity bar-tender was shot dead at a party in Tamarind Court (a newly opened bar then, in South Delhi) for refusing to serve drinks to a guest who landed up at 2 am, way after the bar was closed. This unfortunate incident took place in a ‘high class’ gathering were most of the guests were VIPs, businessmen, top industrialists and celebrities who showed up for the party thrown by Delhi socialite Bina Ramani and fashion designer Malini Ramani. More than 100 people were present that night and most likely had witnessed the death of an innocent woman. Witnesses pointed to Siddharth Vashisht, a.k.a. Manu Sharma, the son of Venod Sharma, a wealthy Congress politician in Haryana, as the murderer. In the ensuing trial, Manu Sharma and a number of others were acquitted on 21 February 2006. Following intense media and public pressure, the prosecution appealed and the Delhi High Court conducted proceedings on a fast track with daily hearings over 25 days. 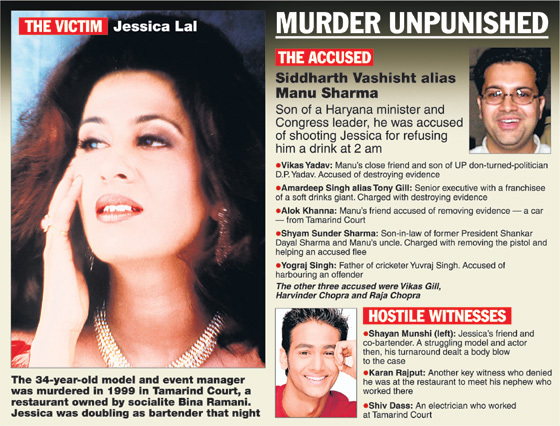 The lower court judgment was found faulty in law, and Manu Sharma was found guilty of having murdered Jessica Lal. He was sentenced to life imprisonment on 20 December 2006. The Jessica Lal murder case went up for trial in August 1999, with Manu charged with murder and his friends charged with related crimes such as destroying evidence and sheltering criminal suspects. Four of the witnesses who had initially said they had seen the murder happen eventually turned hostile. Shayan Munshi, a model and friend who was serving drinks beside Jessica Lall, changed his story completely; as for earlier testimony recorded with the police, he said that the writing was in Hindi, a language he was not familiar with, and it should be repudiated. On 13 May 2006, he was detained at Calcutta airport as he was about to board a flight for Bangkok, along with his wife Peeya Rai Chowdhary. Karan Rajput and Shivdas Yadav also had not seen anything, while Parikshit Sagar said he had left the place before the incident. In a conversation with the sister of Jessica, Karan Rajput is alleged to have played a tape-recording discussing with some friends how Venod Sharma’s people had “won over” several witnesses already. Also, it appears that the cartridges used in the murder were altered. Although the gun was never recovered, these cartridges were for some reason sent for forensic evaluation, where it turned out that they had been fired from different weapons. This led to a further weakening of the prosecution case. The prosecution has proved beyond reasonable doubt the presence of Manu Sharma at the site of the offence. Senior advocate Ram Jethmalani, appearing for Manu Sharma alias Siddharth Vasisth, in the Supreme Court, assailed the High Court verdict which had set aside the trial court judgment acquitting the accused. He alleged that the High Court Bench had made up its mind to hold Sharma guilty. Solicitor General Gopal Subramanium submitted that there was sufficient evidence against Manu Sharma for his involvement in the crime. * April 29-30 1999: Jessica shot at a party in Qutub Colonnade restaurant in south Delhi. * April 30, 1999: Doctors at Apollo Hospital declare Jessica brought dead. * May 2, 1999: Delhi Police recovers Tata Safari car belonging to Manu Sharma, son of Haryana Congress leader Venod Sharma, from Noida, Uttar Pradesh. *May 6, 1999: Manu surrenders before a court in Chandigarh. Subsequently, ten other co-accused including Vikas Yadav, son of UP politician DP Yadav, arrested. *August 3, 1999: Charge sheet filed against accused for killing Jessica under various sections of IPC. *January 31, 2000: Magistrate court commits the case to a Sessions court for trial. *November 23, 2000: Sessions court frames charges for murder against nine persons and discharges one accused Amit Jhingan while declaring Ravinder Sudan alias Titu as proclaimed offender. *May 2, 2001: Court starts recording of prosecution evidence. Deepak Bhojwani, an eye witness deposes before the trial court. *May 3, 2001: Complainant and eye witness Shyan Munshi turns hostile and fails to identify Manu in court. * May 5, 2001: Another eye witness Shiv Das, an electrician at Qutub Colonnade, turns hostile. * May 16, 2001: Third key witness Karan Rajput turns hostile. * July 6, 2001: Malini Ramani, eyewitness, identifies Manu. * October 12, 2001: Socialite Bina Ramani, owner of the restaurant and bar, identifies Manu. * October 17, 2001: George Mailhot, Ramani's Canadian husband, deposes and identifies Manu. * July 20, 2004: Surinder Sharma, controversial investigating officer in the case, deposes after returning from UN assignment in Kosovo. * February 21, 2006: Trial court acquits all nine accused due to lack of evidence against them. * March 13, 2006: Delhi Police file appeal in the high court. * October 3, 2006: High court begins hearing on appeal on a day-to-day basis. * November 29, 2006: High court reserves its verdict. * December 18, 2006: High Court convicts Manu, Vikas Yadav and Amardeep Singh Gill alias Tony and acquits Alok Khanna, Vikas Gill, Harvinder Singh Chopra, Raja Chopra, Shyam Sunder Sharma and Yograj Singh. * December 20, 2006: High Court awards life imprisonment term to main convict Manu Sharma with a fine of Rs 50,000 and also sentences co-convicts Amardeep Singh Gill and Vikas Yadav to four years' prison term with Rs 3,000 fine each. * February 2, 2007: Manu Sharma appeals in the Supreme Court. * March 8, 2007: Supreme Court admits Manu Sharma's appeal. * November 27, 2007: Supreme Court rejects Manu Sharma's bail plea. * May 12, 2008: Supreme Court again rejects Manu Sharma's bail plea. * January 19, 2010: Supreme Court commences hearing on Manu Sharma's appeal. * February 18, 2010: Supreme Court reserves verdict on the appeal of Manu Sharma. * Apr 19, 2010: Supreme Court upholds conviction and life term of Manu.